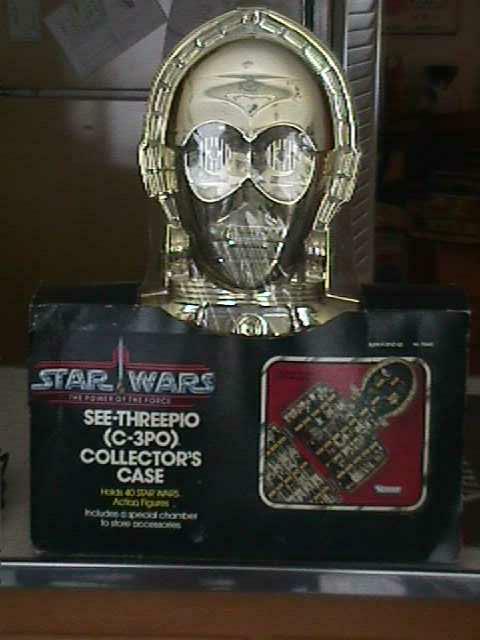 This "unproduced Power of the Force" C-3P0 case turned up in "find" by Jordan Hembrough (a dealer who sells items as "Hollywood Heroes") from Summer 1999 that included other supposedly unproduced Power of the Force items. On the surface, the item might appear authentic, especially since its authenticity was originally based on it "coming from a Kenner source", but unfortunately this is not enough to establish authenticity, and in this case, this piece is undoubtedly fake upon closer analysis. The POTF sticker is actually crude and grainy unlike the high quality photographic images Kenner used on other Toy Fair packaging mock-ups with stickers. The sticker appears to be based on a digital copying technology, making it unlikely that the sticker is 15 years old. The Power of the Force logo image is appears to be copied directly from the logo on the POTF Planetary Maps. Artifacts in this sticker's image appear on only that particular POTF logo image among the other POTF logos, although this fake sticker is larger and grainier than anything ever used in production or mock up packaging from this era. This "find" included other items such as a fake carded Cloud Car Pilot, fake carded Leia, among other toys and figures. Unfortunately, none of these pieces match any POTF mockups appearing in catalog or Toy Fair photography, so there isn't a photo reference available. These fake Power of the Force pieces have appeared on ebay, so buyer beware that they are still hitting the market. When a piece sounds too good to be true, it frequently is!